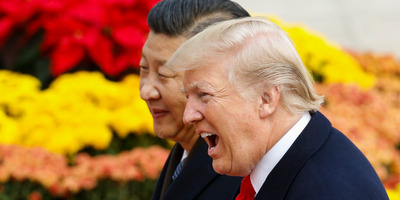 Thomas Peter-Pool/Getty ImagesUS President Donald Trump with China’s President Xi Jinping. China is threatening to retaliate to Trump’s proposed new tariffs. It doesn’t want a trade war, a government official said, but will respond if it’s harmed economically. The tariffs have prompted a wave of condemnation and threats of retaliation around the world, from the EU to Canada. Trump is on the verge of starting a trade war – and China isn’t taking it lying down. China’s National People’s Congress spokesperson Zhang Yesui has threatened to retaliate to the US president’s proposed new tariffs on steel and aluminium, according to reports by the BBC, Voice of America, and elsewhere. China doesn’t want a trade war, the politician said – but it will respond in kind if Trump’s tariffs harm it economically. Yesui said: “China does not want a trade war with the Untied States, but we will absolutely not sit idly by and watch as China’s interests are damaged. The US president announced last week that he plans to introduce 25% tariffs on steel imports and 10% tariffs on aluminium imports. His remarks sparked immediate upheaval in US markets, and a chorus of condemnation around the world from countries concerned about the economic impact of a trade war.